Do Catholic values dominate the lives of young Catholics? We tend to forget that all of our thoughts, actions and feelings are culturally conditioned. The values that predominate our secular culture influence all thinking, acting and feeling within that culture. So a very practical question all Catholics, especially young ones, should be considering these days is: Whose values or which values dominate my thoughts, actions and feelings? Do Catholic values dominate my life? Culture and its dominant values are transmitted socially, not genetically. Learning is therefore important if a shared way of life (a culture) is to be preserved. Formal education is part, but only part, of the process of enculturation; entertainment, recreation, imitation and observation play a big role. John Lennon had his head handed to him when he remarked that The Beatles were more popular than Jesus. But he did have a point. The word “show” or “showing” is used by Mead five times in that brief scan of the forces that shape the minds and actions of the young. Obviously, “showtime” — on stage, television, movie screen and, by extension, “radio shows” — is an element to be examined when exploring the question of the formation of values. In a very real sense, schooltime is in competition with showtime. Catholic schooltime should create a mindset or climate of opinion that is clear on central principles and critical of false values. As fewer Catholics experience Catholic education, the issue of conveying and preserving Catholic culture looms all the larger. Behind the ad stands a value waiting to be confronted by the values that define one’s Catholic culture. The young are indeed caught in a crossfire; without realizing it, they are on a battleground. All Catholics should be open to change, of course, but only for the better. They should be perceptive enough to avoid being seduced away from their Catholic values and from the thoughts, actions and feelings that their Catholic values might reasonably be expected to foster. And all of us should want to be sure that those Catholic values are getting through in the first place. 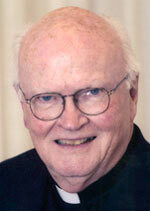 Jesuit Father William J. Byron is university professor of business and society at St. Joseph’s University, Philadelphia. Email: wbyron@sju.edu.